Berberine is a compound that is remarkable and is extracted from a diversity of plants and herbs. It is routinely used in Chinese medicine for thousands of years. It is found in nature and in the wild and has had numerous studies and scientific research done on it. Berberine was used as an anti-microbial agent and a treatment to boost energy. It is very popular now and located in health food stores. What I like about Berberine is that it treats high blood sugar and aids in losing weight too. It has been shown to decrease the production of sugar (glucose) in the liver. There was a test done, in both animals and humans (and this impressed me) where talking or being administered a daily dose of 1500 mg of Berberine was just as effective in treating blood glucose levels as the exact same amount of the popular drug Metformin! There was also evidence reported that Berberine also can have anti depressant effects, but for me, I was never depressed so I wouldn’t know if it provided that particular benefit for me personally. It also reduces inflammation and that is very important. Berberine affects an enzyme in the body(it is called activated protein kinase or AMPK for short) that boosts energy and this is especially beneficial when you’re feeling a bit low on energy. I found that it did help me with my energy levels. This AMPK enzyme is unique in that it will decrease the amount of extra sugar in the blood that your liver may produce. The AMPK helps me with losing weight as well because it improves the insulin sensitivity and works to regulate the glucose in the liver. I’m not saying that it will work for everyone because I’m sure that it won’t but it works for me. I’m taking Metformin now and hope that at some point my doctor can take me off it. Realistically? It doesn’t mean going back to not eating healthy and doing no exercise. There are other factors too. You have to have your lab work done regularly and test your blood sugar regularly. If you aren’t, then you should get your own blood sugar monitor. There are many products that can help lower your blood sugar. 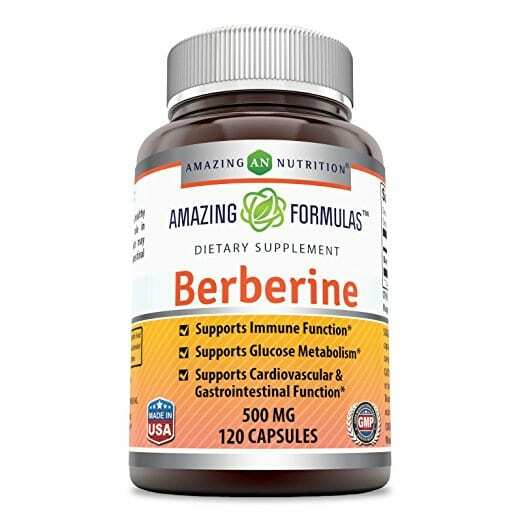 According to reviews, Berberine is one of the most popular ones. Like with anything else, I would suggest discussing anything you take with your physician first (like I did) because you never know if there are interactions with any particular medications that you may be taking. This is IMPORTANT! There were 387 reviews at this time on Amazon. Most of the comments were positive and customers would purchase again, but there were some negative opinions shared by folks as well. One particular woman stated that she was only giving it three stars because her husband had no difference in his blood sugars but was still willing to give more time to see if there’s a change. One other individual said that while they have noticed any changes yet yet being through half of the bottle, that she was going to stick it out because she had faith it would work. On the more positive side, these comments weren’t an issue for them as one woman claimed that her husband’s blood glucose numbers were lowered from 160 to 110 and that this is an awesome supplement! Another remark from a satisfied person was that it’s a good product with a good formula to help lower your blood sugars! My opinion is that Berberine is a “B+” product. I feel that berberine and diabetes belong together. For me it helps with weight loss, lowering blood sugar, and giving me more energy. I always say that not everything will work for everybody. But I go with the majority of positive reviews and agree that it’s a product that does what it claims. Berberine and diabetes, it’s a great treatment for diabetes. You may or may not agree, but there’s only one way to know for sure. Thank you for reading and feel free to leave any questions or comments below! Gymnema Sylvestre and Diabetes-How Does it Crush Diabetes? This is a really balanced review of a product I feel I might have to try. The listed pros meet all the criteria for my own health needs and the cons are so few that they are not a concern. The fact that it has received 387 reviews which were mostly positive also validates it. I like the fact it is made from plants and herbs too. Thank you for reviewing this product so comprehensively. I will be trying it but I will wait until I have a blood sugar test first. You have convinced me of its value. I always like to be thorough in reviewing a product that I recommend. The fact that is a plant and has more positive reviews is important in deciding whether or not to try it. Berberine is becoming more known than ever before. It has benefits for diabetes and lowering blood sugar and the fact that it is a natural treatment is why I recommend it. I agree with you. Get your blood sugar tested first and speak with your doctor. Thank you for commenting Judy! I find your post interesting and I am always looking for natural ways to treat my aliments. I don’t have diabetes, but do have high cholesterol and blood pressure. Will Berberine diabetes treatment help with these symptom as well? Because I noticed that you mentioned some of the benefits of this product could lower cholesterol levels and blood pressure. I feel that natural ways are the way to treat anything today. That’s why I am passionate about lowering blood sugar levels naturally. It’s good that you don’t have diabetes, but not good that you have high cholesterol and high blood pressure. Yes, while it may not lower cholesterol and blood pressure significantly, it does help in lowering these problems.